I get this email several times each year – “Why did my student get 0/5 (or 1/5 or 2/5) on their transposition?”. I can usually tell them why before even opening the attachment to look at it. Why? Because most of the time, the student has made one of the following 3 mistakes on their transposition question:…wait, let’s have some fun. Here is a Transposition Question with the “answer” below. What mark would you give this (out of /5)? 1. a) Name the key of the following melody. b) Transpose the given melody down a Major 6. Use the correct Key Signature. Name the key of the new melody. So, what mark did you give this answer? The student would have received 1 mark for correctly naming the key of the given melody. The student would have received 1 mark for correctly naming the key of the new melody. The student would have received no marks for the melody itself. Why? Simply because the 5th flat of the Key Signature was written incorrectly as F flat. When a Key Signature is not written with all the flats or sharps placed on the correct lines or spaces, it changes how the music is played. When the “sound” of the music is affected, the entire melody is marked as being incorrect. If the Key Signature is incorrect, or if any part of the Key Signature is incorrect, the entire melody is marked as being incorrect. There are no part marks given for having all the correct notes, rhythms, dynamics, etc. Let’s look at this answer for our given melody being transposed down a Major 6th. What mark will you give this? In this example, the student has written 5 flats, however the flats have been placed as if they are in the Treble Staff. The melody is in the Bass Staff. The correct Key Signature placement must be used for the given Clef Sign. Again, if the Key Signature is incorrect, or if any part of the Key Signature is incorrect, the entire melody is marked as being incorrect. What mark will you give this answer? Remember, the instructions are to transpose the given melody down a Major 6. That’s right – another “zero” for the transposition. Why? Because D flat Major has 5 flats, not 4! The correct Key Signature must be used. Again, if the Key Signature is incorrect, or if any part of the Key Signature is incorrect, the entire melody is marked as being incorrect. So, what is the correct answer? 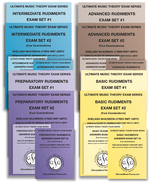 When preparing for a nationally recognized theory exam like the Royal Conservatory of Music Theory Examinations or the Royal Conservatory Music Development Program Theory Examinations, students should complete all the Ultimate Music Theory Exam Series Practice Exams – there are 4 Practice Exams in Set #1 and 4 Practice Exams in Set #2. 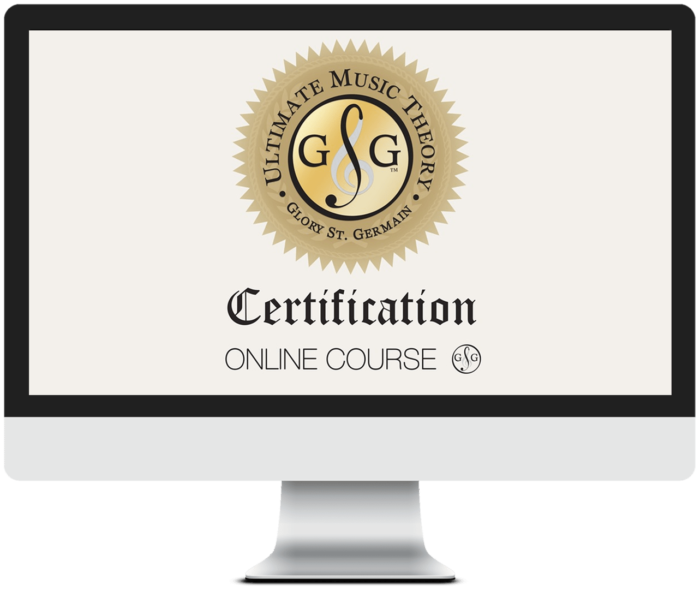 Watch the VIDEO - Ultimate Music Theory Exam Series is the only Exam Series with Answer Books. Yes, we know that you know all the answers. But isn’t it nice to not have to think all the time – to just mark and make corrections? I know that even though I wrote the Series, I always use my Answer Books to mark my student’s Exams. PS – Join the Conversation! I love using my Ultimate Music Theory Workbooks for Ear Training and Sight Reading. Does anyone else have their students play their Transposition exercises to strengthen Sight Reading skills? Good to know!!! I have another question about theory exams . Is the pass mark 50 or 60 % as in practical exams. I have one student who is struggling with basic level and need to know what to tell her. The pass is 60%. A mark between 60-69% is a Pass; a mark between 70-79% is Honors; a mark between 80-89% is First Class Honors and a mark between 90-100% is First Class Honors With Distinction. 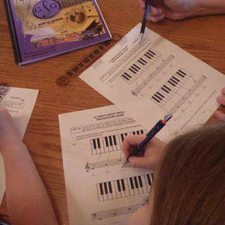 Students who have used the Ultimate Music Theory Workbooks to prepare for their examination AND who receive 100% on their exam become members of the 100% Club! They will receive a Gold Pin and a Certificate. Check out the 100% Club link! For students who are struggling due to Special Needs or Learning Issues, accommodations can be made to support a successful exam experience. AND are part marks given for stems, etc. when the key signature is correct? When the key signature is correct, then the melody will be marked. There is usually .5 deductions per measure for incorrect stems, dots and missing articulation. Excellent question – I will add it to my To Blog list!! Thanks! This is also a good time to introduce the fact that major 6 down is the same as minor third up. This time for sure you will name the correct key as Db not plain D.
No worries! Did you double check your work before you checked the answer? If not, then that is an excellent lesson to share with your students. And remember, my nickname is “Boo-Boo” for a reason. Sometimes I feel like I am the Queen of silly mistakes!